Max Velocity Tactical offers mobility/convoy operations classes. This is not an open enrollment scheduled class. It will be conducted as private training. Requirements will be discussed with the client in order to formulate a curriculum based on needs, location, and the facilities available. A standard class length would be two days, depending on location and requirements. Family/Group ‘bug out’ in a hostile environment. Tactical employment of vehicles as a mobility asset. Use of mobility platforms in patrolling. Offensive & defensive uses of vehicles. ‘Vehicles’ can include any of your standard cars, pickups, SUVs, and also other mobility platforms such as ATVs. Vehicle preparation, loading and equipment. Employment/utility of armored/unarmored vehicles in contact. Mobility assets as a sustainment/resupply/firepower platform. The MVT facility in WV is suitable location for ATV-based trainiing if you wish to trailer in your ATVs. It is not suitable for vehicle convoy operations. Many of the vehicle convoy drills can be accomplished on a suitable stretch of private road, even a driveway maybe 200 yards long. Open areas/fields can also be used. More in depth movement and tactical operations require a network of vehicle suitable roads/tracks. Training can be conducted with a mixture of dry, with airsoft, blanks or live. To conduct live training, vehicles must be able to drive onto a suitable live firing area. A standard berm range can be used in this way, if the backstop is long enough. Full safety will be implemented to MVT live firing standards. Please EMAIL to discuss rates and your requirements. Below: A live fire training session from Fallujah in 2006, focusing on vehicle and dismounted break contact drills. The drills are not perfect, it was an internal team training day, not a demonstration video. It serves as a good example of possible hostile environment break contact drills. Not included in the video is the ‘all vehicles immobilized’ scenario. The details on mobility and convoy operations can be found in ‘Contact! 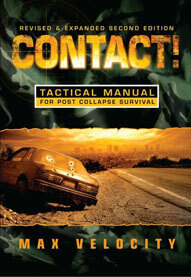 A Tactical manual for Post Collapse Survival’ – suggested pre-class reading. Looks like a very interesting class. Since so much happens in vehicles, I hope to attend something like this in the future, when we have a bunch of ppl together for it. Several buddies and I are working on trying to do this just outside of Spartanburg, SC this Spring. You are more than welcome to attend if you are willing to travel down this way. Still trying to figure out how many vehicles, drivers, shooters, non-shooter adults, kids, etc. we will have so that Max can work out the #’s. I’ll keep you posted. I would be happy to be a student in that class. I am just north of there. Am very interested in mobility/convoy class this spring. Keep us posted. Roger that. Will advise asap. Please contact me via tatersc@hushmail.com to begin the coordination & scheduling process.